This double album brings together orchestral scores from across nearly fifty years of Stravinsky’s life. His compositional style developed a great deal over that period, and apart from the very last period this is a fairly representative collection. The first piece historically, though it is oddly placed second on disc one, is the recently rediscovered Chant Funèbre (1909), composed as a tribute to his teacher Rimsky-Korsakov. Then the Parisian Ballets Russes phase is represented by the Rite of Spring (1913), the neoclassical style by Jeu de Cartes (1937) and the Concerto in D (1947), and his first serial music by (some of) Agon (1957). 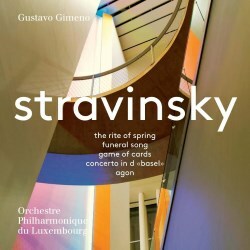 The performances are given by the Orchestre Philharmonique du Luxembourg and their Music Director Gustavo Gimeno, continuing their series of Pentatone SACDs, of which earlier issues offered works by Shostakovich, Bruckner, Ravel and Mahler. Reviews suggested that Pentatone had found an orchestra and conductor worthy of such exposure, and of the company’s devotion to top quality recorded sound. For the most part this issue reinforces that growing reputation. The discovery of Chant Funèbre did not quite add a major masterpiece to the Stravinsky canon, but rather an intriguing indication of his early stylistic direction – in fact the mysterious opening prefigures that of Firebird. No less a Stravinsky authority than Stephen Walsh considers it his best piece before Firebird (though there is not much competition except maybe the Scherzo fantastique or Feu d’artifice, which are the two preceding opus numbers). Certainly any Stravinsky lover needs a recording of the work and this is the one to get. It is an eloquently played lamentation, greatly benefitting from a more funereal pace than Chailly’s world premiere recording on Decca - Gimeno adds two whole minutes to Chailly’s 10:30. It would have made an ideal opening to this collection, which is launched instead with a very familiar high bassoon solo. The world does not need another Rite of Spring, so it is a pity it was included here rather than some less familiar work or works. Fortunately it is a very good account. It has the attributes that a modern version should, in that it is precise and balletic, favouring accuracy and balance over violence of impact or drama, and is imbued with the spirit of the dance. Perhaps it is closest therefore to the approach of Boulez in his interpretations, in that by letting us hear as much of score’s detail as possible it ends up being unexpectedly exciting. It has a properly swift tempo for the final Sacrificial Dance, but alas it ends with a long unmarked pause before the final sffff chord, which, in reviewing Boulez’s CBS disc, the composer condemned thus: “The ending is a disaster. Boulez separates the upbeat from the downbeat, thus changing the rhythm and turning a not-very-good-idea into a vulgar one” (page 241, Themes and Conclusions, Faber 1972). But Gimeno has that mannerism in common with most other modern versions and many listeners nowadays might be surprised to hear it played as written. Jeu de Cartes and the other pieces on disc 2 have had many fewer recordings than the Rite, and offer the main interest of the collection after the Chant Funèbre. This “Card Game” is the real deal (pun intended), well played and persuasively directed. The timings for the outer movements (the 1st and 3nd “Deals” as they are called) are a bit longer than Stravinsky’s own CBS disc (made in 1964 with the Cleveland Orchestra), 5:52 and 8:34 against the composer’s 5:16 and 7:33 and consequently feel a bit more leisurely. But the music’s infectious and engaging character survives this perfectly well, and the 2nd Deal matches exactly Stravinsky’s 9:44. The version by Ilan Volkov with the BBC Scottish Orchestra (Hyperion 2009) is excellent, too. He is much closer to Stravinsky’s outer movements (5:25 and 7:29) but swifter in the middle one (8:37). The Concerto in D showcases the excellent Luxembourg strings, and it sounds like a large body of them, in this compact 12 minute score. That was the length Stravinsky proposed to the commissioner, Paul Sacher, when Sacher offered just half the composer’s requested fee! But it packs plenty of invention into that brief time span. Here Gimeno is closer to Stravinsky’s recorded times too, and obtains slightly more polished string playing. In Agon timings again are the same as the composer’s, apart from in the Pas de deux; Stravinsky in his 1957 recording takes 4:13 but Gimeno gives his dancers just 3:38. If you don’t know Agon don’t be put off by the reference above to serial music. It still sounds born of his neo-classical ballet style and its fourteen very short sections are full of character, all very well realised in this, the best single performance on a very good set. There is no direct rival, but that Hyperion disc will be worth considering if it is Agon and Jeu de Cartes that interest you most, as it adds the composer’s Orpheus, a lovely half-hour ballet from the mid-1940s. All are excellent performances. These Pentatone performances are all fine too, but the collection is not exactly a bargain. Omitting the Rite, and putting the Chant Funèbre on what is now disc 2, would have made a more attractive proposition on a single 70 minute disc. As it is, you pay for two full price discs with rather short measure and with a Rite of Spring most collectors probably won’t need. But you do get very good notes by Stephen Walsh, excellent SACD sound throughout, and that essential Chant Funèbre.